The image that is read – which is to say, the image in the now of its recognizability – bears to the highest degree the imprint of the perilous critical moment on which reading is founded. To be an artist in exile, on the eve of public commemorations of an epic cartographic act that conditioned the exile, requires intercession. On the 70th anniversary of the Indian subcontinent’s independence from colonial rule and the Partition of 1947, memories of displacement and the re-founding of home became a well-rehearsed narrative in the substantial newspaper coverage of the historic events. The artist Zarina’s work was curated for this anniversary in the exhibition ‘Zarina: Dark Roads’ at the Asian/Pacific/American Institute at New York University (on view 5 October 2017 to 2 February 2018), as part of her residency there in 2017–18. Yet in this exhibition this well-rehearsed narrative itself becomes the point of acute crisis. This intercession is a reading of her images from that exhibition, in an attempt to explain exile in the enduring constitutive violence of partition, one that requires grappling with the ‘minority’ question at its heart, and what it means to long for ‘home’ as a place one can travel to but never return, on the politics of nostalgia, in a post-genocide national order that has now become the norm. The line in Zarina’s prints, and Zarina’s accidental alignment with Hannah Arendt as an exilic philosopher of the twentieth century, bear upon this reading. It is in some ways a continuation of the line of enquiry inaugured by Amir Mufti when he threw Zarina and Arendt together,  but with a different intent – to pierce through not the paradigmatic Jewish experience in Europe, but, rather, the violence of estrangement that became a prerequisite for crafting national freedoms on paper and in time. The cartographic line on degree paper wields an edifice of power: the massive army of surveyors that conquered imperial lands included sappers and coolies, draftsmen and photographers, civil engineers and printmakers. Both the camera and the aeroplane were almost instantly harnessed to the technologies of surveying, and along with plane tables, pendulum clocks, odometers, and altazimuth theodolites, a presumption of precision and scaled abstraction, measurement with a claim to representation, subdued a landscape onto paper. The pamphlet Notes on Printing Papers Suitable for Maps deliberates on the strength of Cowan’s rag litho paper and the water resistant Insetsukioku Japanese paper, widely used in revenue collection maps, and further backed by cloth for use in military operations. Notes on the Drawing of New Standard Maps provides instructions for the size of lettering to be used for important and less important place-names. The Glossary of Vernacular Terms used in Survey of India Maps, for example, distinguishes between dagh (mountain) and dasht (open space),  and The Method of Constructing the International Atlas of the World on a scale from one to one million explains the problems of scaling an entire world into lines on degree paper. These documents from a massive imperial archive, which became our national inheritance everywhere, reveal the accumulation of mundane bureaucratic regulations that came to govern and give aesthetic form, and not just scientific authority, to the cartographic line. Guarded as secrets of modern militarised statecraft, on the one hand, and wildly dispersed through a fiercely schooled cartographic literacy on the other, we respond to cartographic lines (as distinguished from other kinds of primeval lines), with immediate recognition because of their aesthetic form, and they constrain our very world-ing (our understanding of where we are and where we cannot go). There are many ways to align a biography to explain an artist’s work, and dates carry a density, like a peg, on which many lives hang. Zarina Hashmi was born in Aligarh in 1937 (the year Arendt lost her German citizenship). After receiving a degree in mathematics in 1958 from Aligarh Muslim University, where her father was a history professor, marriage took her abroad and to printmaking studios where she found her art. She studied woodblock printing in Bangkok and Tokyo, and intaglio with Samuel W. Hayter at Atelier 17 in Paris. The exhibition ‘Workshop and Legacy: Stanley William Hayter, Krishna Reddy, Zarina Hashmi’ at New York’s Metropolitan Museum in 2016–17 recuperated Hayter’s studio and the work of two of his illustrious students, Krishna Reddy and Zarina. When Zarina finally moved to New York City on her own in 1976, Arendt was already dead and was buried just outside the city in Annandale-on-the-Hudson. Some forty years later, Zarina still lives and works in her one-room, 29th Street east side apartment, as an artist in exile. But in order to understand this word ‘exile’, and what conditions Zarina’s exile, let me return to Zarina’s prints, and to Arendt, in order to read them. So many of Zarina’s works mime the cartographic line – the semblance of regulation of line and letter renders them recognisable as cartographic – from Cities I Called Home to These Cities blotted into the Wildnerness. But in mimesis, although it is the semblance that gives us our first recognition, there is an alterity, an opposition built into the very same line – as such, the lines in Zarina’s work draw upon all the power wielded by cartographic lines, as well as all their ghouls, their shadows. In the series of woodcuts, These Cities blotted into the Wildnerness (2003), Srebenica is both a map of Srebenica and simultaneously a graveyard, while Ahmedabad is a divided city and emptied of its soul. A number of artists have taken on the Radcliffe Line in their work, and the landmark exhibition curated by Iftikhar Dadi and Hammad Nassar at Cornell University in 2009, ‘Lines of Control: Partition as a Productive Space’, brought together a number of visual interrogations of this borderline. Consider Iftikhar Dadi and Nalini Malani’s Bloodlines (1997), crafted with sequences, or Shilpa Gupta’s performance-based installation with 3,364 metres of cloth, entitled 1:998.9, 3360 kms of Fenced Border, East Sunderbans to Teen Math, which invokes both line and scale on cloth. But both these works operate by unhinging the line from its cartographic aesthetics, to shimmer and perform as unkempt border. Zarina’s Dividing Line, also part of the ‘Lines of Control’ exhibition, and described by Amir Mufti as ‘a gesture of staggering economy’,  harnesses the pulsating aesthetics of the cartographic line, the line gouged out of the woodblock, printed on Okawara paper, and as such it intensifies our apprehension of this mimesis – for the technological, bureaucratic, political and juridical character of the Radcliffe Line is immediately recognisable, as is its absurdity. As Mufti asks, what does it divide? And it is here, between the line and its double, that a primeval reverberation is set in motion. Abyss inverts the darkness, and the recognisable Radcliffe Line becomes instead the precipice. It is not a solid line, but is rendered rather as a multitude of lines – which could be read as an opening up of the cartographic line’s closures. However, as a precipice to abysmal darkness on either side, it is the only line of sight – fragmentary, as it necessarily may be – the only line of sight, of possibility, of possible habitation. Hannah Arendt, writing from the middle of a long and terrifying twentieth century, articulated the new predicament of statelessness in a world reduced to nation-states, ‘when belonging to the community into which one is born is no longer a matter of course and not belonging no longer a matter of choice’. Statelessness, this line of sight that in Zarina’s Abyss is both historically specific (Partition, 1947) and of our age, is a political condition, as Arendt explains, which includes both ‘minorities’ and ‘refugees’ – those rendered xenos (foreign, strange) within the territorial limits represented by the cartographic line, and those rendered xenos by crossing those limits. Arendt recognised the coloniality of such a ‘law of exception’, where an external body, the League of Nations, had to act as a guarantor of the rights of some, and the irony that this crisis of the nation-state form came precisely ‘when the right to national self-determination’ and ‘the supremacy of the will of the nation over all legal and “abstract” institutions, was universally accepted’. Estranged as ‘minorities’, as they came to be seen as primordial threats to the nation-state-in-crisis and as they faced mass denationalisation, incarceration, murder and expulsion, unprecedented numbers of people became ‘refugees’. Thus Arendt’s concern around twentieth century statelessness was not simply the lack of citizenship, but rather the xenic structure of statelessness, the precarity of being rendered ‘foreign’, as minority or refugee, and the severe, catastrophic inadequacies of law and history when bound to the nation-state form. It could be argued that the experiments of forging a modern plural nationalism drew upon pre-modern forms of living together, and was held together by the unifying demands of anticoloniality itself. Yet the work of a plural ‘Indian’ nationalism was set against the world staging of nation-states in which the perilous fate of the Minority Treaties, the old and the new nation-states of Europe at war, and mass expulsions before, during and after the war, made these experiments even more difficult to sustain. In 1947, Arendt was de jure stateless herself. The extraordinary experiments of a plural Indian nationalism had fallen apart, and two nation-states were carved out on the basis of incommensurability. Muslims were to be given a separate nation-state because they were a separate foreign/minority/nation, and could now be turned out of the national idea of India. Zarina remembers spending 1947 in Delhi, seeing Purana Qila and devastated refugees on the move. Her family chose to stay ‘at home’ in Aligarh initially, but Partition did render Muslim minorities undesirables, unwanted strangers, guests who had overstayed their welcome. While she was abroad with her husband, her family migrated to Karachi in the 1950s (as part of a massive post-genocide, middle class migration of Muslim minorities across the western border into Pakistan, and of Hindu minorities across the eastern border into India) to shed the status of unwanted minority-citizen and with the hope of becoming welcomed refugee-citizens instead. Zarina, perhaps more than any other artist, confronts the crisis of belonging set in motion as her family crossed the Radcliffe Line, leaving her on her own, elsewhere, with no ‘home’ to return to. As such, in Abyss, in Zarina’s fragmentary line of sight – the only line of sight – this statelessness is both the terse limit and the conditional possibility that, I would argue, moves through much of her reterritorialising mimetic cartographies – her world-ing through so many other post-genocide landscapes, from Srebenica to Ahmedabad. The counterpoint to statelessness is arguably not simply the concrete right to have rights; rather, it includes the far more ambiguous right to belonging as well, and it is precisely ‘[w]hen belonging to a community into which one is born is no longer a matter of course and not belonging no longer a matter of choice’  that this right to belonging makes its appearance in the acute longing for home. and thirty eight miles away. The measured and unmeasurable distance traversed by the poem, printed inside an artist’s book, is not only spatial but also temporal. The distance between where Zarina is and the place she is ‘at home’ is anchored in the present tense – an indelible distance – but it is also an assemblage of memory, and an invitation to a future journey that may never be taken. A preoccupation with home has suffused Zarina’s work over the years. Homes (1981), Father’s House 1898–1994 (1994), Homes I Made/A Life in Nine Lines (1997) and Home is a Foreign Place (1999) are some of her works in which she invokes the remembered home through abstraction and documentary restraint, and seems acutely aware of the tense simultaneity of the homey and the uncanny, of belonging and estrangement. ‘Nostalgia’, this diffuse longing for home, was a medical term coined by a Swiss doctor in the seventeenth century to express through ‘the force of the sound’ of the word itself ‘the sad mood originating from the desire for return to one’s native land’. 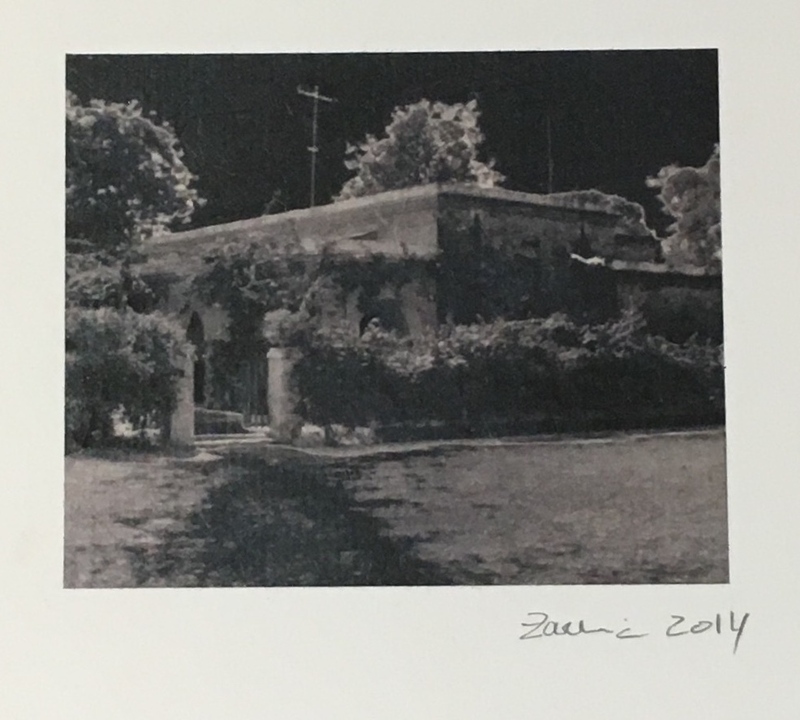 This sadness is most poignant in Untitled, a dark print of a photograph of Tarwalabangla, mimesis of a mimesis, in which the TV antenna becomes fluorescent against a blackened sky (an inversion of the light in the original photograph), and the once redolent garden begins to grey. As the beloved childhood home darkens in materiality, as if in memory, there is an ache of irretrievable loss, and tenacity in the refusal to let it disappear. Svetlana Boym’s meditations on nostalgia restore to the ‘historical emotion’ – what she calls a ‘symptom of our age’ – its critical work against ‘modern notions of time and history’, and its political work in suturing the ‘relationship between individual biography and the biography of groups or nations, between personal and collective memory’. Zarina’s profound sense of loss in displacement and her refusal to let it go, to move on and be ‘at home’ in New York, is a refusal to accept the narrative of progress, the esteemed arrival of the immigrant. By repeatedly and tenaciously locating home in a dilapidated house off Shibli Road in Aligarh, she refuses the estrangement of Muslims from India and the severing of partition that transformed her family into Pakistanis. I still wish I had stayed in that house, but that house has fallen down, and I always say that it fell with the weight of memories. Vazira Fazila-Yacoobali Zamindar is associate professor of history at Brown University in Providence, Rhode Isl, and author of The Long Partition and the Making of Modern South Asia: Refugees, Boundaries, Histories, Columbia University Press, 2007.